Butch Patrick (born Patrick Alan Caples) on August 2, 1953 in Los Angeles, California is an American former Child actor. Beginning his professional acting career at the age of eight, Patrick is perhaps best known for his role as Eddie Munster on the CBS comedy television series The Munsters from 1964 to 1966 and in the 1966 feature film"Munsters, Go Home"
When recounting how he began his acting career, Patrick explained "I owe my career to my sister. She was the one who got me started and gave me all the encouragement. She always wanted to be an actress and was on the casting call sheet one day. She was asked if there were any other children at home. She told them about me, and I got some small roles, then some bigger ones..."
In 1964, Patrick landed the role of child werewolf Eddie Munster starring alongside Fred Gwynne as Herman Munster, Yvonne DeCarlo as Lily Munster, Al Lewis as Grandpa, on the CBS television series,The Munsters, a fantasy situation comedy loosely based on Universal's movie monsters. The role of Eddie was originally portrayed by child actor Happy Derman in the pilot episode before Patrick was ultimately selected out of 500 boys for the role. When asked how he landed the role of Eddie, Patrick recalled "I had a lot of experience. But maybe it was because my fangs were my own teeth. My eyeteeth were so bad, that even when I closed my mouth they stuck out. I was about a head smaller than the other kids, and they liked that because it played off Herman's height." Living on the East Coast at the time, Patrick commuted to Los Angeles every week during filming of the series, appearing in 70 episodes during The Munsters two season run from 1964 to 1966. In 1971, Patrick landed the starring role on the ABC Saturday morning children's program Lidsville. In the "psychedelic" fantasy series, Patrick portrayed Mark, a boy lost in a strange land of walking, talking, singing hats, opposite veteran character actors Charles Nelson Reilly and Billie Hayes. 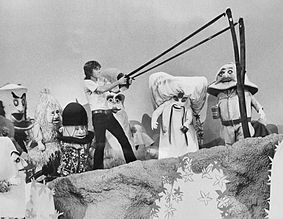 Created by Sid and Marty Krofft,Lidsville bore similarities to the premise of its predecessor, H.R. Pufnstuf, and lasted two seasons until its end in 1973. In 1975, Patrick left acting to work for his father and began to learn to play the bass. In 1983, he recorded the song, "Whatever Happened To Eddie?" (b/w "Little Monsters"), with several instrumentalists and backup singers under the group name "Eddie and the Monsters." Set to the tune of the Munsters theme, the song details his life as a Munster. ("You might wonder why I have a dragon for a pet – Well he's just there to keep me company on the set.") He recorded a second single, "It's Only Halloween", which was released on Park Lane Drive Records in 2007. 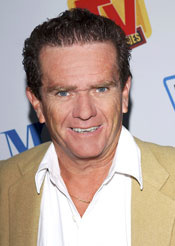 In addition to his music, Patrick returned to occasional film and television work, including making cameo appearances as "Himself" on episodes of the Fox animated television series The Simpsons and the 2003 comedy film Dickie Roberts: Former Child Star, as well as appearing as a grown-up Eddie Munster in a Little Caesars Pizza commercial. Patrick made a cameo in the 2005 retro-horror film Frankenstein vs. the Creature from Blood Cove directed by William Winckler playing a man who had become a werewolf, speaking a line of dialog in comical reference to The Munsters. Butch Patrick travels the world as a celebrity guest of: car shows, conventions, and autograph shows as well as being "Mr. Halloween" providing consulting services to the Haunted House Attraction Industry. Butch also exports classic cars to Austrailia.